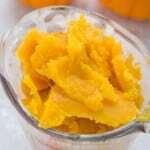 EASY Step by Step Instructions on how to make Fresh Pumpkin Puree from Pumpkins! You can use any type of pumpkin for this. Pumpkin Puree can be used in cooking and baking year round! Use this for pumpkin cookies, pies, cakes, pancakes and more! So you know I love pumpkins. So if you grow your own pumpkins, or will be getting a pumpkin in October to decorate your house with, you can use that pumpkin for much more than making your home extra beautiful (pumpkins are lovely, they brighten up everything). You can also eat them! There is delicious pumpkin puree waiting for you inside every single pumpkin wishing you would cut it open and scoop it into brownie mix. Trust me, they tell me this. My pumpkins talk to me, what they don’t talk to you? Pumpkin puree is so easy to make! The hardest part is the emotional attachment of cutting your pumpkin in half. I always tell myself I’m going to be strong then I end up almost crying and taking goodbye pictures with it. I always always talk to my pumpkins during this process, I just want them to know it’s going to be ok when I cut them up and put them into the oven to bake then process them until it’s smooth. So what pumpkins are the best for pumpkin puree? Some will say to only use Sugar or Pie Pumpkins due to their taste and ease with desserts. But I have found that practically any pumpkin makes good puree. 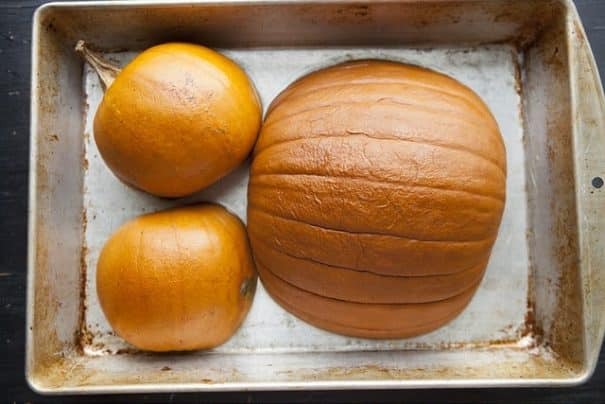 I do this to our Jack-O-Lanterns that can fit into my oven and I don’t find there is a big taste difference at all. So I say try them all and see if you prefer one of the other. I will use them all! So let’s go.. pumpkin puree party! Let’s make this! Once you have fresh pumpkin puree, you will glare at the can on the shelf at the store. 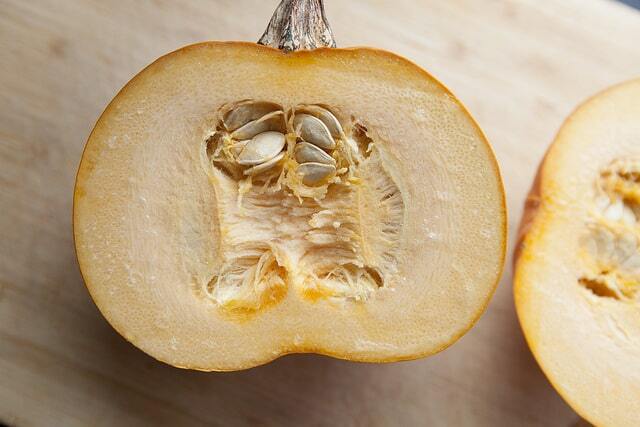 Fresh pumpkin is bursting with flavor! 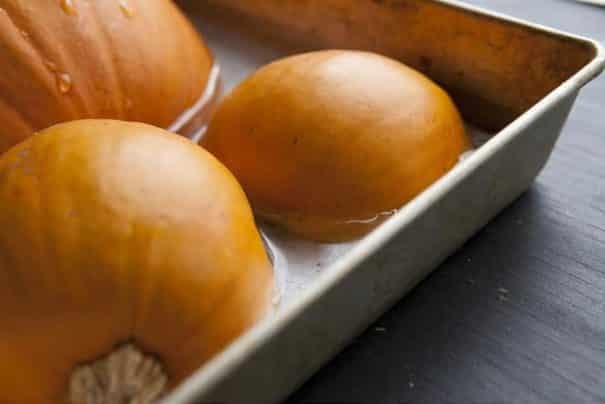 Pumpkin puree can be frozen beautifully up to a year! So when you decide to make a pumpkin casserole in February, you just open up your freezer and you got it covered. Pumpkin puree, you are the best. 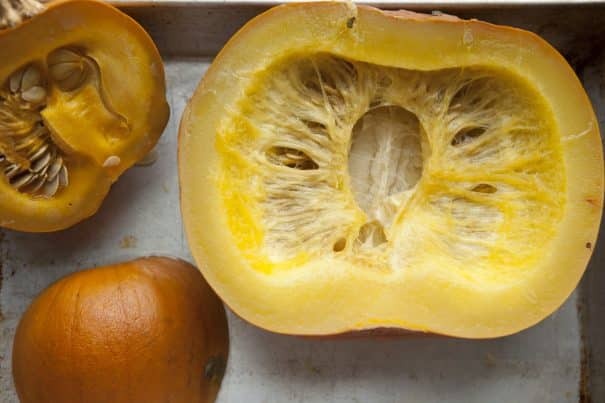 How do I make pumpkin puree? There’s one other thing I wanted to quickly say about this. Like I mentioned in this post in making applesauce, I have a Weston food strainer and it’s changing my life. For this specific post I am using the pumpkin/squash attachment. I ended up buying the whole set of attachments because I decided I needed them all in my life. If you are into making sauces, purees, baby foods, jellies, salsas, mashed potatoes, juices etc you will fall madly in love with it. Seriously. It just makes everything smoother. If you do not have a food strainer, don’t worry, I also included instructions in the recipe box on how to use your food processor/blender instead. Pumpkins… you guys are magic. These 3 guys have been staring at me waiting for their pumpkin puree moment. Well pumpkins, it’s that time. The first cut is always the hardest. It’ll be ok little pumpkin, I swear. If you are using a food strainer, don’t do anything. If are you not using a food strainer, get a spoon and get all the strings/seeds out. 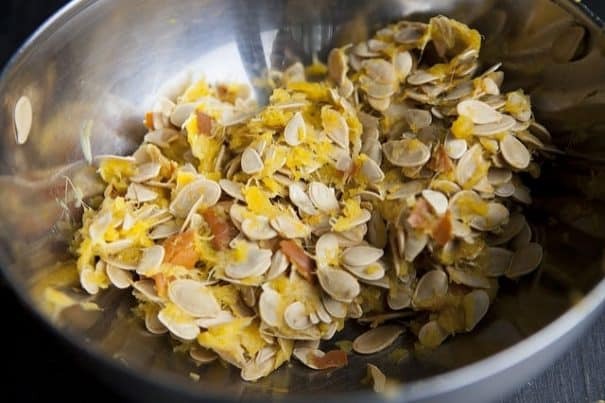 Set the seeds aside for later if you are going to to make roasted pumpkin seeds (yum). 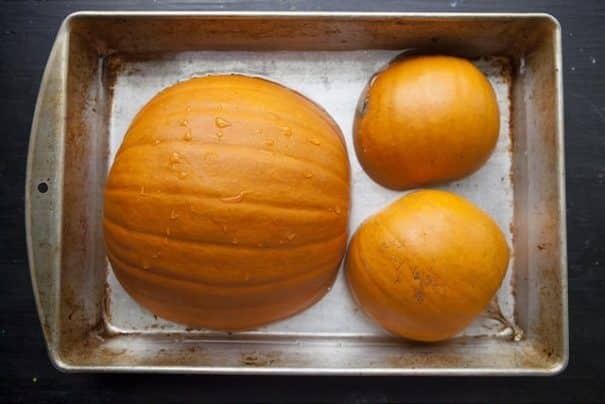 Take your pumpkins and put them face down in a pan. 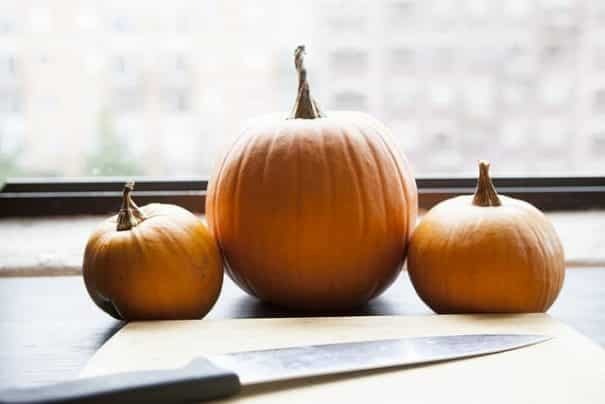 If you are doing multiple pumpkins, rearrange so they can fit best. You might have to use more than one pan as well. Then fill up the pan with about 1/4 inch water. When they come out you will see they appear soft now, sometimes the pumpkins even get indented and “fall in”. Totally ok. Good job pumpkins, you made it through the hot part. The pumpkins will be very hot, as well as the remaining water in the pan so be careful. When you flip the pumpkins over you will see the insides are very soft. Soft pumpkin is going to make some awesome pumpkin puree. Now let me re-introduce you to my Weston Food Strainer. The strainer is great because you can get different attachments for it, such as sauces, salsas, grapes, berries and pumpkin. This is the pumpkin attachment. 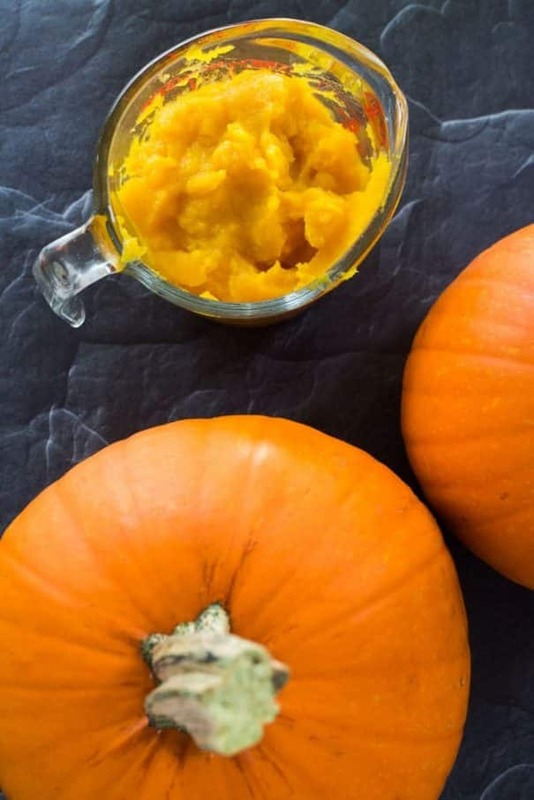 If you do not have a Food Strainer, you can make Pumpkin Puree too! With a spoon remove all the inside strings and seeds, set aside. With a spoon remove the pumpkin and put into a food processor. 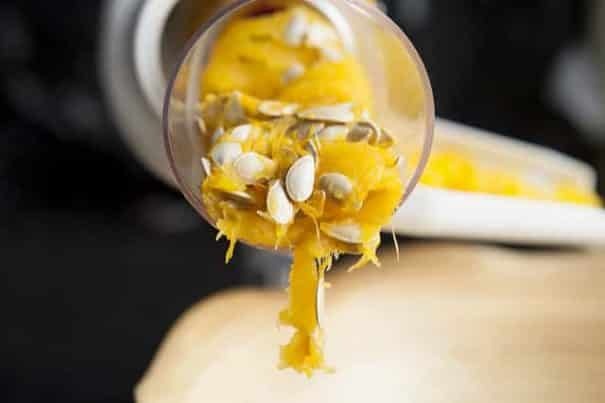 Turn the food processor on and pulse until you have smooth pumpkin. Then use or freeze accordingly. For the strainer, I cut the pumpkins up into smaller pieces and then start to crank the handle for the pumpkin to go down into the strainer. What comes out one side is the most beautiful, perfect pumpkin puree. Keep cranking until you have no more pumpkins left. What comes out the other side is the strings and seeds. 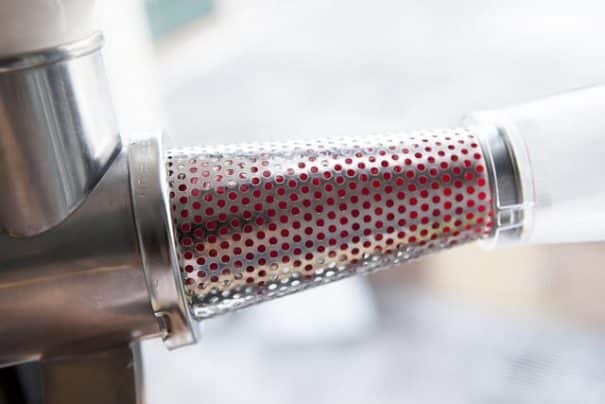 The strainer does the hard work for you! This is my favorite part because one of my least favorite kitchen duties is to spoon seeds and strings out of pumpkin, it takes forever. But the strainer takes that hard work away! When all the strings, seeds come out, I will run this through the strainer about 2-3 more times just to make sure there’s no pumpkin hiding in there. You are left with a bowl of seeds, which I sure hope you are going to roast because they are one of my favorite snacks ever! And you will have giant bowl full of fresh pumpkin puree. I got about 5 cups out of this which is a fair amount as 2 of them were small sugar pumpkins. High 5 on making some fresh puree. The canned puree really can’t even try to compete with this freshness. 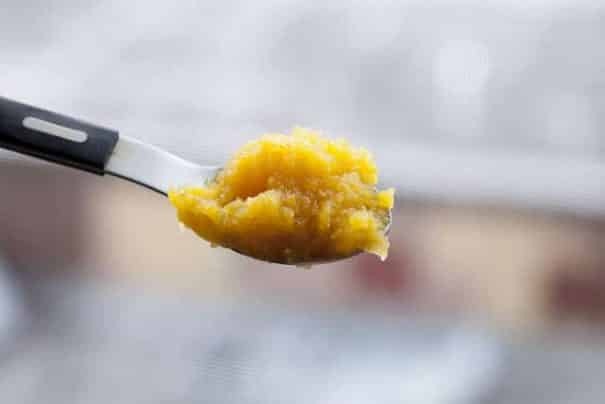 And let me tell you, it makes the best pumpkin pies..
Pumpkin puree freezes beautifully up to a year. I like to put it into 8 oz bags or 15 oz bags because recipes usually always call for one of these. I also put some into a mason jar to go into the refrigerator so I can cook with it in the next few days. Pumpkin away friends! Have fun! Looking for pumpkin recipes? 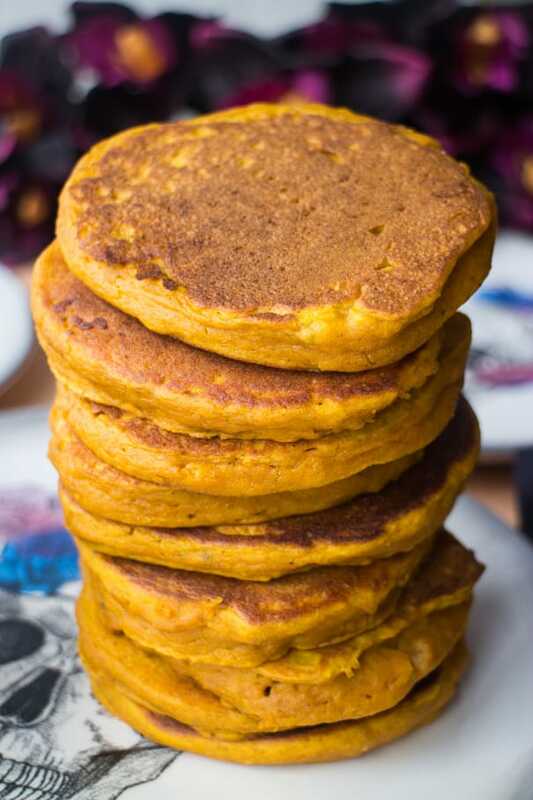 Try my pumpkin pancakes, pumpkin cookies and pumpkin roll! Put pumpkin face down in pan. Fill pan with 1/4 inch water. Bake for 1 hour. Let cool. 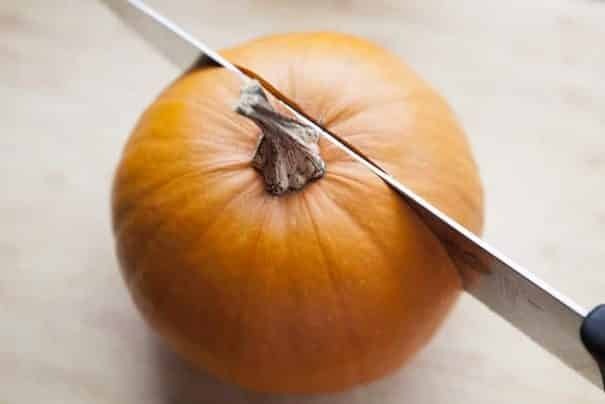 Cut the skin away from pumpkin, it should almost pull right off. Disregard skin. Cut pumpkin into chunks. Run pumpkin through food strainer, you will then have pumpkin puree. Cut the pumpkin in half. Scoop the guts and seeds out. Disregard the guts, save the seeds to make roasted pumpkin seeds later on if you'd like. 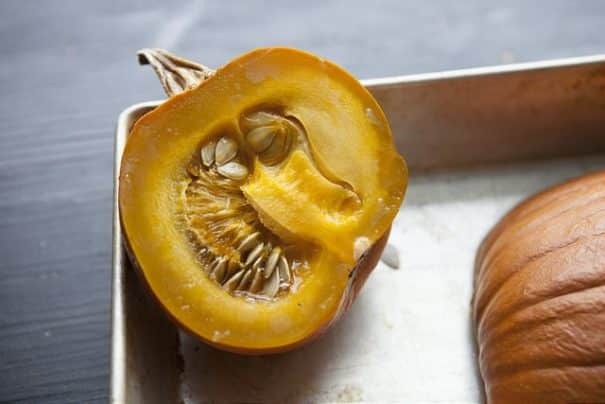 Put pumpkin in food processor or blender and pulse until it becomes puree. Im so excited for Fall vegetables.. I am so excited for the Fall! Great post! I’m determined to make some pumpkin pie this fall with the pumpkins in our garden – just like my mom use to when I was a kid. This is great information, thanks for sharing!! I’m coming to raid your freezer. Well, maybe I’ll wait another month, I know it will be even better then 🙂 Seriously, I can’t wait to see all your wonderful pumpkin recipes Pamela! Pumpkins – aren’t they just the best?! You are too funny Pamela! I’m totally gonna take a goodbye pumpkin pic this year. This is essentially reading for the upcoming holiday season, and a welcome replacement for all that canned pumpkin nonsense. Those pumpkins are getting me pumped for fall. I love pumpkin anything…never made my own puree, but I’m sure it blows the canned stuff away. I’ll have to come back to this and make my own! I hope you give it a try Jaclyn! Fall is my favorite season, gets me so excited about the upcoming weather, clothes options and yummy food! I’m always afraid that making fresh puree will negatively affect the structure of pumpkin pies and whatnot… I really hope I’m wrong, because I’m giving it a go this fall… need to cut out the cans! Thanks for the encouragement, as usual! I want that food strainer! I have a sudden craving for pumpkin bread. Yum! SO excited for pumpkin season! 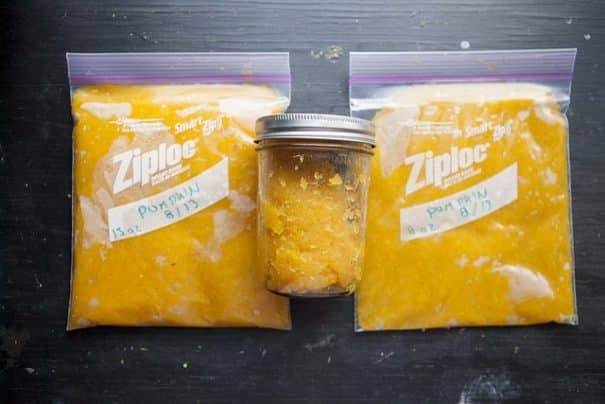 I’ve always wanted to try and make my own pumpkin puree since I plow through so much of it in the fall season. After reading your blog title, it makes me think of fall already! I can’t wait for fall, that’s when Europe gets slightly cooler. And yes for pumpkins, and pumpkin pie is all I want now! 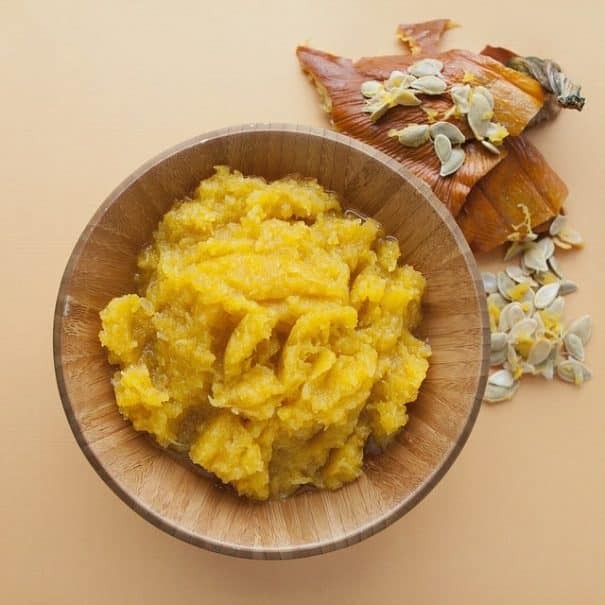 Thank you for sharing your pumpkin puree recipe! I want to use it for Thanksgiving and for pumpkin pies! And your Weston Food strainer looks amazing, I’ve to check out that tool! 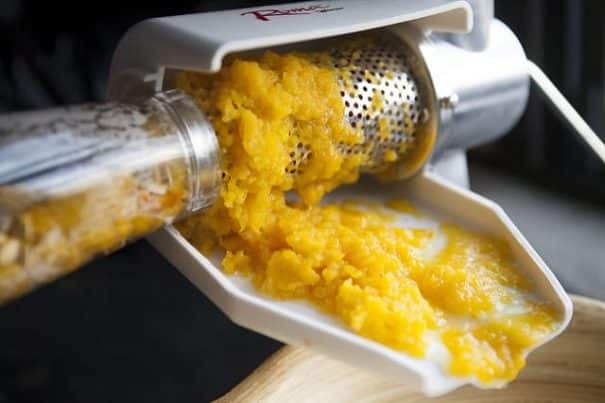 Love pumpkin puree and LOVE that strainer. It’s fantastic. I’m in love with the strainer! Looks so delicious and I love the photos! I know how you feel about cutting it into 2…but I’m sure you’ll make great use of the puree, can’t wait for the things you come up with. 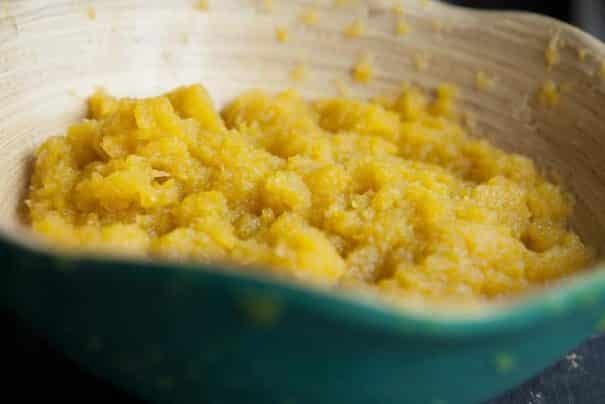 I made pumkin puree halwa(indian dessert), it was soooo yummy. That sounds yummy! I have so many pumpkin recipes planned! OMG! I am loving your purée making machine. It spits the seeds out???? How awesome is that? I know, isn’t it the coolest? I have baked with pumpkin twice and made different dishes with a pumpkin during the holidays and boy was it delicious! I can’t wait to indulge in a bunch of delicious recipes for the holidays! Me too! In my opinion Fall has some of the best savory recipes attached to it.. can’t wait! Helpful post! Thanks for sharing! Where the heck did you find pumpkins in the middle of August? I am impressed. That aside, I can’t wait for all the fall related recipes up my sleeve and now with this recipe I can ignore the stupid can on the shelf. We grew them! 🙂 Fresh puree is really the best! Wondering if a food mill will work also? The Weston food strainer looks like a real neat kitchen gadget to have. DUDE! I just did EXACTLY this, but with a butternut squash. Great minds think alike!! High 5! What are you going to make?! Counting the days until I can start baking the pumpkin recipes! Love this post so much!! Great tutorial. I love pumpkin desserts but the thought of pureeing pumpkin always sounded intimidating to me. I am willing to give it a shot after all that you’ve explained! This might just have convinced me to get that strainer. Yes! I would recommend the attachments too! I know that you will love my chili too! I love your soup, yum! I have a pumpkin chile, a pumpkin mac and cheese and a pumpkin soup recipe coming in the next few weeks! I love making soups and chilis with it, it works beautifully with pumpkin! I plan on eating ALL THE PUMPKIN come fall. This post is super useful!! ALL! Hahaha, you made me laugh. Enjoy Joanne! I bake with pumpkin all the time but I always just opt for the stuff in the can. I think you’ve given me the courage to make homemade pumpkin puree. That strainer looks awesome! Pamela, this is fantastic. Pumpkins are good in baked cookies and cakes. I usually process everything in the food processor, I don’t have the food strainers. We have a pumpkin farm across the street, I mean like literally across the street from my house. You’d love it. I love roasted pumpkin seeds, I remember those from my childhood spending summer and weekends at my grandmother’s, we’d munch on those all the time. Hang on, lets try this again:). I tried this last fall and it didn’t quite turn out. As much as I use pumpkin, this will be so handy. Pinning so I can try again! Love this homemade pumpkin puree tutorial, girl! You were very thorough. Thanks for sharing, Pamela. Getting excited for fall now! Pinning! Pamela, these photos are unbelievable! So pretty. I was under the impression that only pie or sugar pumpkins could be used for cooking, so it’s great to know that any old pumpkin will do. I have only ever used canned pumpkin, but maybe this year I will try making my own puree with these instructions. Thanks! Hi Andi, I sure hope you give it a try – I think you’ll be really happy with the taste! 🙂 Have a great day! I just did a Long Island Cheese Pumpkin (so yummy) and got A LOT of puree from it that i froze! I have a few more to do as well. I just use the food processor, but I’m a bit envious of your tool! Hey Barbara, that pumpkin pie is going to be the ABSOLUTE best! Enjoy, I wish I could steal a slice! What temperature does the oven need to be? Hey Ash, 325 degrees, all the instructions are in the recipe card. Enjoy the recipe!